Can I use a prepaid credit card to prepay my participation fee? If you don't have a credit card, but want to join in prepaid events, you can use a prepaid credit card. You can also create a PayPal account with your prepaid credit card. Once you've purchased a prepaid credit card, completing prepayment is very speedy. Just continue to payment after registering for the event. 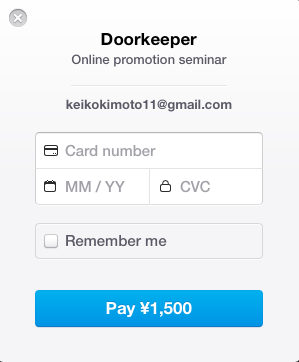 Then click "Pay with credit card" and enter your prepaid credit card information. Sign up for PayPal and use your prepaid credit card information to create an account. Please understand that PayPal does not officially recommend using prepaid credit cards, and the payments through your PayPal account with a prepaid credit card might not necessarily be guaranteed. To check the cards you can use for your PayPal account, please directly contact PayPal.